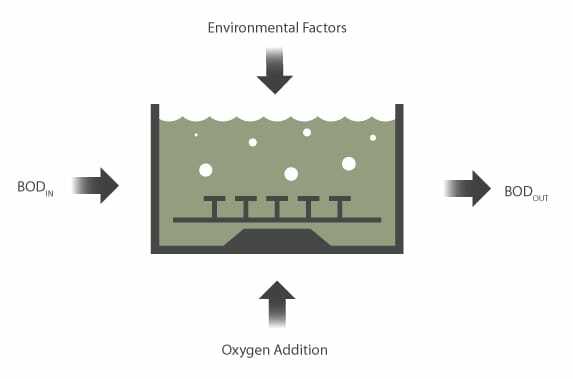 Wastewater treatment plants typically operate aeration tanks above the required levels of dissolved oxygen. This is done to ensure that the system can handle shock loads. However, aeration constitutes a significant portion of the total energy costs of a wastewater treatment plant and therefore, significant savings can be achieved by optimizing the process. Furthermore, excess oxygen can have detrimental effects on the operation of the biological aeration process. By monitoring BOD and COD in real time, adjustments can be made to the aeration rate greatly reducing the energy consumption. When high organic loads are detected, aeration rate can be increased accordingly to ensure adequate treatment; while at low organic load periods, aeration can be turned down to save energy. When shock loads are detected, pre-treatment can be boosted at the primary clarifier by aiding sedimentation with coagulants such as ferric chloride.